YUCCA MOUNTAIN — Inside a hot, dark tunnel in a remote part of the Nevada desert, a couple dozen congressmen, congressional staffers and federal officials stand before a large burnt orange metal door flanked by two red stoplights, one on either side. Suddenly, the red stoplights turn yellow, and the burnt orange door begins to roll up and recede into the ceiling. Inside is an even longer tunnel, dotted with lights along one side and narrowing to a small black dot. Though impossible to see, the tunnel forms a 5-mile long horseshoe with an opening at the other end, all that exists today of a proposal to turn Yucca Mountain into a nuclear waste repository. The group slowly makes its way partway down the illuminated portion of the tunnel, carefully stepping over bolts and railroad ties in the process. It shows. Inside the tunnel, the only signs of life are the footprints of a ring-tailed cat preserved in the dust that has settled on the pipes running along one side of the tunnel wall; outside, the white streaks of owl droppings are visible on pipes. But if Illinois Rep. John Shimkus has his way, life — the human kind — will come to Yucca Mountain not as it did in the 1990s to construct an experimental facility but to turn the site into a long-term nuclear waste repository that will receive shipments of radioactive waste from 121 sites spanning 39 states. Then, after the waste is loaded into the mountain, it will be abandoned for at least the next one million years as it slowly decays. In May, Shimkus spearheaded the House passage of legislation to restart the long stalled process of building the repository at Yucca Mountain, which passed in an overwhelming 340-to-72 vote. The bill is considered unlikely to come before the Senate ahead of the 2018 election because of the possible impact its passage could have on Republican U.S. Sen. Dean Heller’s re-election changes. Nevadans aren’t so keen on the idea of the federal government dumping its nuclear waste on Nevada, though. Gov. Brian Sandoval and all but one member of Nevada’s congressional delegation are staunchly opposed to the proposal as are 58 percent of Nevadans, according to a poll conducted by The Nevada Independent by the Mellman Group last year. 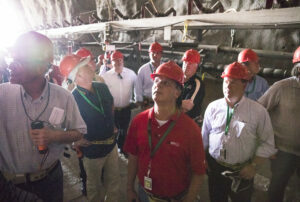 Elected officials from Nevada were conspicuously absent from the daylong Saturday trip to Yucca Mountain, which was led by Shimkus and included 11 other House members, all whom voted in favor of Shimkus’s bill, congressional staff and other federal officials. Earlier this week, Titus decried the visit as a “junket” and an excuse for her colleagues to spend a weekend on the Strip, while Rosen called it a “political stunt.” Both congresswomen and Rep. Ruben Kihuen declined invitations from Shimkus to attend the tour. 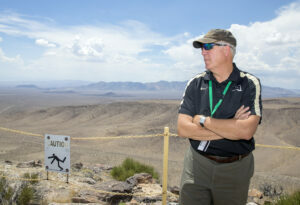 But the purpose of the trip — and dragging a dozen congress members across the country to a remote site 100 miles northwest of Las Vegas in Nye County that sits on federal land near the edge of the Nevada Test Site — in Shimkus’s view was to both demonstrate the scientific soundness of the project as well as Yucca’s remoteness to House members. To underscore the point, the tour included a visit to the crest of Yucca Mountain where Boyle, who served as the tour guide, pointed to the horizon to show where the nearest bit of civilization, Amargosa Valley, exists. Boyle noted to congress members that the town used to have two gas stations — someone chimed in that it now has only one — along with a casino and a brothel. “If we’re not at the end of the universe, we’re awful close,” Boyle told lawmakers. One congress member asked Boyle what the people in Amargosa Valley think of the project. He said he wasn’t sure but that if you ask most people what their biggest concern is, it’s not Yucca Mountain. “I think most people believe that the government, that there are enough checks and balances that they’ll at least try to do the right thing,” Boyle said, adding, “I think the majority of Nevadans don’t care” about Yucca Mountain. 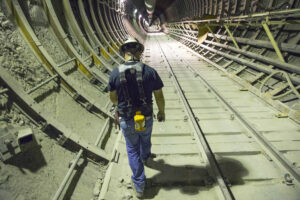 Inside the tunnel, Boyle explained to lawmakers the details of scientific experiments that have been conducted at Yucca Mountain in an effort to show the safety of constructing a repository. The state has its own research and more than 200 contentions that they say will prove the project is not safe. In general, proponents argue that the site is scientifically sound and that its remote, desert location makes it safe to bury waste 1,000 feet below ground — and is much safer than letting it sit at sites across the country. But opponents say that the site is geologically and hydrologically complex as well as prone to earthquakes and volcanoes, which makes the prospect of storing nuclear waste for 10,000 — or a million — years unworkable. In an alcove off of the entrance to the north tunnel, Boyle told lawmakers about an experiment conducted with drip irrigators to prove Yucca’s water tightness. Boyle also noted the puddles outside, the result of monsoon season storms in Southern Nevada. “But there are no drips in here,” he said. But later, in the south tunnel, Boyle acknowledged there’s no way to keep water out of the mountain completely. Throughout the tour, Shimkus and the other congress members prodded Boyle with questions. Shimkus, who has been to Yucca several times before, and Rep. Joe Barton, a Republican from Texas who has been to Yucca once before, played devil’s advocate; others genuinely were curious. For instance, Barton chimed in to ask Boyle to explain what will be done about the heat given off by the decaying nuclear material. Boyle explained that scientists heated the rock around Yucca to 200° Celsius for four years. All that happened, he said, is that the water within the rock surrounding Yucca — known as volcanic tuff — turned into steam and escaped through the top of the rock where it condensed and pooled into water safely outside the mountain. “There were flames going into the rocks for four years,” he said. In the south tunnel, Rep. Steve Womack, a Republican from Arkansas, filmed a short video stressing the urgency of moving forward with the Yucca Mountain project. In an interview, he said that his state is one of the 39 states with no long-term storage option for its high-level nuclear waste. He said that he’s “always respectful” of how his Nevada colleagues feel and, as a former mayor, that he understands the “not in my backyard” sentiment. However, he said the national interest in building a repository is significant. Barton, too, had sympathy for his Nevada counterparts. The Texas congressman said that he was the only member on the tour who was in House when it passed a bill in 1987 to narrow down three candidate disposal sites down to just Yucca Mountain, known colloquially in the state as the “Screw Nevada Bill,” and he expressed some regret for how Congress went about the process. Had Congress created a consent-based siting process, things would he different, he said.